To make any home look good you need to concentrate on the outside as well as the inside. Water features give real character to a garden especially if they are well planned and incorporate moving water with feature lighting at night. When deciding on the location for the pond and ideally you need at least 1000mm around the edge for access and planting. If you want to keep fish then don’t make the pond too small 3mx4m is a good size and would support up to 20 gold fish. Generally fish will bread in number to the size of pond that they feel comfortable in and they consider is sufficient food to support them. Plan your pond to have an artistic shape. The centre needs to be about 600mm deep and around the surrounding edges a shelf about 250mm wide and 200mm deep. This is to support some water plants like lilies that don’t like deep water. Mark out the area of the pond and dig out. Depending on the levels of the rest of you garden you may be able to re-grade the soil levels with the surrounding area. If this is not suitable you will need to hire a skip and have it removed. Once the hole is dug line it with 50mm of sand and then lay a under felt before installing a butyl pond liner. Fill the liner with water and layout the liner as the water gets deeper to ensure that it seats down evenly. When the pond is filled to about 100mm from its final depth work you way round the edge seating in the perimeter stones. 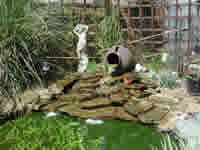 For the best effect the stones need to be submerged so that the liner cannot be seen when the pond is full of water. At one side of the pond a water feature or waterfall will improve the effect. At this part you need to grade the ground and lay more pond liner up the incline. Ensure that the liner is channelled so that the water finds its way back to the main pond. Then lay York stone or other slate type stone over the top to create a water fall. What looks great is to discharge the water through an old pot by cutting a hole in the base and installing a 25mm bore flexible hole under the liner and back to the pond where it is connected to a submersible pump. In the base of the pot at the lowest point you need to drill a drain hole and fit a cork in it. This will be used to drain down through the winter otherwise to water will freeze and damage the pot. A standard pond pump with a capacity of above 3000litres/hour can be fitted to the hose pipe and the mains cable taken to a convenient point terminating on the surface with weather proof electrical accessories and linking in to the house electrical supply. Ensure that the supply is fitted with a RCD circuit breaker and the pump is installed in accordance with the manufactures recommendations. Around the planting area of the pond you can install low voltage lighting giving an excellent feature at night. The picture shows how you can plant around the pond and also install water plants which will help to oxygenate the water. The pond is now ready to stock with fish. It’s best to start with say five and see how they get on. They may also breed and naturally increase in number. One important safety issue. If you have small children remember to guard the pond with suitable fencing because small children can easily fall in and although the water levels are relatively shallow serious accidents have been known to happen. Also in our experience kids love to throw stones in a pond and the fence will stop this.